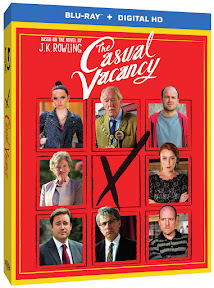 A contemporary Dickensian tragicomic tale of two communities and thirty-four characters, 2012's The Casual Vacancy may not have been part of J.K. Rowling's phenomenally popular Harry Potter series but that didn't stop the BBC and HBO from securing the rights to develop the U.K.'s fastest-selling novel in three years. No stranger to weaving socioeconomic and political themes into Potter's fantastical coming-of-age storylines, as a book targeted to adults instead of children Vacancy offered Rowling the opportunity to do more than just shed a little light on the issues about which she was passionate. Digging deeper into the topic of class warfare including its main byproduct of prejudice, in the novel Rowling likened the situation to a sort of suburban apartheid set in a west country town (likely modeled on her birthplace of Yate, Gloucestershire). Yet determined not to lose herself in political theory, she took a cue from Potter and instead focused on her brilliantly conceived characters. Delving into the difference a small election could make in the lives and futures of the well-to-do Pagford community that's largely populated by those that wish to permanently separate from the poor residents living in the neighboring council estate dubbed The Fields, Rowling explores this from all sides to bring her concerns vibrantly to life. Rather than voting to make The Fields part of the nearby city once and for all, the miniseries enhances the dramatic impact by paring the issue down even further so that the future a vital local community center becomes the focal point of the Pagford Parrish Council election. Offering not just a safe haven for the children in both communities (especially those in the impoverished, drug dominated Fields) but also an all-important methadone and health clinic that's much easier for recovering addicts to visit than the one only accessible by unreliable bus service in the city, the aptly named Sweetlove House serves as a important humanistic symbol throughout the work. And after the death of the beloved council member Barry Fairbrother (well played by Rory Kinnear), who was raised in The Fields but – thanks to the opportunities available with social welfare programs and places like Sweetlove House – went on to become a respected champion for civil rights in Pagford, the community center becomes a permanent reminder of Barry for the rest of the miniseries. With his seat newly up for grabs and the Council suddenly missing their voice of reason, Pagford descends into chaos, especially after an unknown hacker calling themselves "The Ghost of Barry Fairbrother" begins posting the town's dirty secrets on the Council's website to expose the hypocrisy of those trying to claim his seat for the upcoming election. Hoping to close the community center and instead build a tourist destination spa in its place (despite the fact that most of its neighboring locals wouldn't be able to afford it), the wealthiest and most powerful Pagford residents try to scheme their way to a victory, oblivious to the fact that everyone has something to hide and Barry's ghosts are watching. Given Rowling's love of the classics, it's only fitting that veteran BBC miniseries scripter Sarah Phelps (known for the channel's recent critically acclaimed presentation of Great Expectations) was tapped to adapt Rowling's ambitious tome. 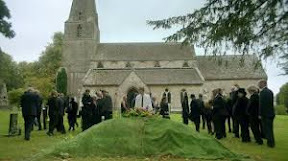 Staying true to Rowling's character-driven roots, although The Casual Vacancy is anchored by a large ensemble cast including the phenomenal Abigail Lawrie whose deceptively tough, battle-scarred sixteen-year-old Fields resident Krystal Weedon is the heart of the miniseries, Phelps tactfully cuts out the novel's excess. Merging some characters into one while removing others completely, perhaps most impressively the screenwriter reconfigured key players in order to ensure everything harks back to the most important issues that Rowling longed to get across. Although the jump from satirical SNL sketch worthy supporting roles to achingly real portraits of those who could easily be your friends and neighbors feels a bit jarring, Casual is at its best when it abandons the Potter-like players and delivers fly-on-the-wall docudrama. Understanding that, Phelps sharpens her take on book even more, letting Rowling's stunningly crafted, flawed yet fascinating characters lead the way to terrific, often heartbreaking effect. 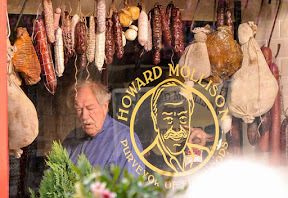 While some of the film's plot points are a tad too predictable and after the first episode far too much time is spent on unlikable characters that fail to move the plot forward, all in all, it's an intelligently crafted work which (like Animal Farm or The Wizard of Oz) takes an inventive approach to political allegory. And this production is timelier than ever – not only for Americans gearing up for the exhausting mudslinging that goes along with a presidential election – but also relatable on a global scale for the clever way that Rowling's small town war can be applied to any number of settings and situations. However, just like certain aspects of the satire fail to translate from the page, Phelps made an incredibly smart decision to rewrite the devastatingly heavy-handed, Thomas Hardy style ending that may have come off as far too hopeless on the screen. Understanding that the viewer needs to be able to see the ways in which ignorance, apathy, bureaucracy, fear, and prejudice have failed its characters in order to fully appreciate not only what went wrong but also what went right (and how it could've stayed that way), Phelps's more affecting bittersweet coda reminds us of the basic good in people. 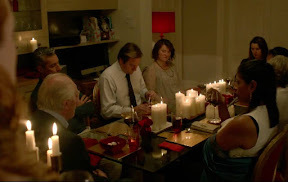 Reassuring us that it's never too late to try and fight for what's right (even if you're outnumbered and going it alone), the superbly crafted film helmed by Jonny Campbell plays better as a three hour feature than a three part miniseries. Bolstered by top notch production values, Vacancy's strong cast and crew meets the screenplay halfway, abridging Rowling's epic with clever costuming, production design, and cinematography that aids in our understanding of this tale of two communities and way too many subplots through visual storytelling. An extremely polished yet meandering miniseries that mirrors the state of Pagford after the death of Fairbrother by temporarily losing its way after the exceptionally crafted first installment, despite a few missteps, Vacancy finds its footing again and again.